Fill out a form. Note: You do not need a separate form to change your address. Call the Fund Office at 1-800-251-4107. Please note: direct deposit information taken over the phone must be recorded. Before you fill out the form or call, be sure you know your bank’s routing number and your account number. 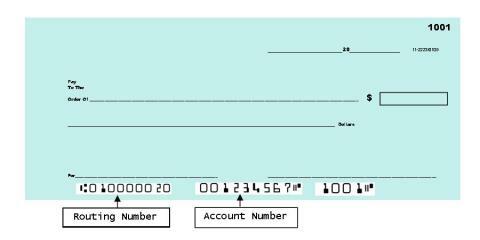 If you have a checking account, this information can be found on the bottom of a check (see image). **If you are using a reloadable debit card, the account number and routing number should be provided from the company who issues the cards. (The account number is not the number on the face of the card). If you are unsure of the routing number and/or account number, call your bank to confirm. The cutoff for changes before the pay cycle is the 15th of every month. For example, if you wanted to change your direct deposit for December 2012 payment, you would need to call on or before November 15, 2012. If you send in a form, it would need to be received on or before November 15, 2012. There is no guarantee that enrollments submitted after the 15th will be completed before the pay cycle.